Plácido Domingo (Simon Boccanegra), Michele Pertusi (Jacopo Fiesco), Maija Kovalevska (Amelia Grimaldi), Roberto De Biasio (Gabriele Adorno), Marco Caria (Paolo Albiani), Dan Paul Dumitrescu (Pietro), etc. A few hours before, I had arrived at the opera almost at the last minute. While I was leaving my coat at the cloakroom, I heard the first signal for curtain raising. I knew Peter Stein’s minimalist production, but I did not want to miss a single second of the performance. Maybe the word “production” is not suitable here, as the scenery is almost inexistent, what matters is the stage direction, the movement of the characters on the stage and maybe, most of all, the movement of the chorus. And the costumes. And the torches in act III, real torches that illuminate the battle field where the popolani defeated the guelfi. And Simon’s fallings at the end, when, worn away by poison, he sings divinely between life and death, between fainting and the reality of the power that has to consume him until his very last minute… The production is now old, but one does not notice this because, as I said, there was nothing to get old in it. The first time was in Salzburg, in 2002. Then, when Claudio Abbado returned after 14 years to conduct again opera in Italy, he conducted Simon Boccanegra in Firenze, using Peter Stein’s stage direction, in the same year. And in autumn it became permanent in Staatsoper, where the very good DVD with Gatti and Hampson was recorded. The first to appear on stage were Paolo and Pietro, Marco Caria and Dan Paul Dumitrescu. They sang well, especially the latter, who has a timbre more interesting than Pertusi’s. But the people outside were waiting for him. The great super tenor. Vienna was more and more cold and quiet. Majia Kovalevska left the opera too. She really is beautiful, like she seemed to be on stage. Vedi in quest’ora bruna was flawless. She was very good and reminded me of Angela Gheorghiu in many moments, less the velvet in the voice, as her timbre is not so distinct. 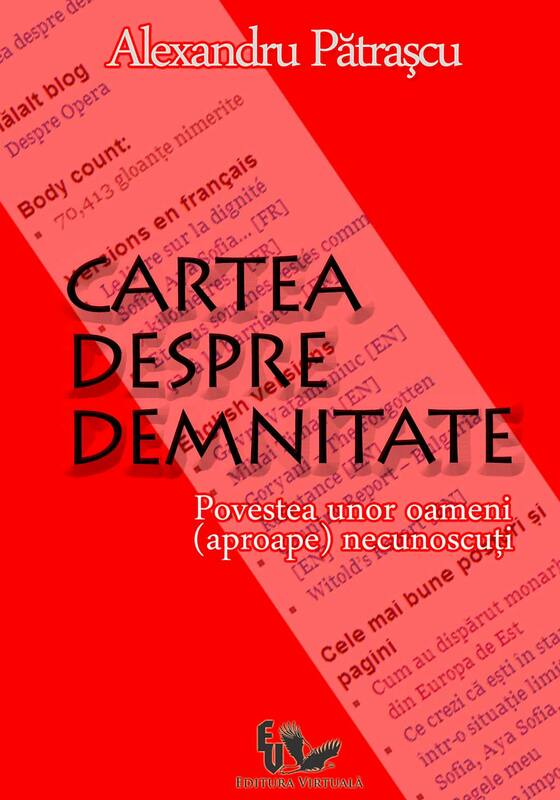 And yet, she really was Amelia, a girl nearly 27 years old, which is young in our days, but, in Petrarca’s times, she was a mature woman, capable of raising to the level of equality with her father, even if he was a doge, when it was about the love of her life. A maturity that Simon understands and accepts, and in the duet in act II, the one of the reunion, the one with such a beautiful and such Verdian music, the doge’s last words, sublimated in a falsetto with such a tender diminuendo, Filglia!, caused a rapture in the opera hall. A few tens of seconds until the end of the scene, the audience had nearly lost its patience. Because Simon’s love for his recently found daughter became an immense love of an audience that finds again its idol and waits for the first occasion to show this to him. De Biasio came with the soprano, relaxed and glad to see people waiting for him, too. He did not stay much. His voice of lyric tenor made wonders, he is in another league than yesterday’s Pinkerton . He knew his part with all its nuances, stepping on the gas to the fullest when needed (Sento avvampar), being totally pious in his duet with Fiesco (Vieni a me, ti benedico), he did not let anything pass unfiltered, even his outbursts (Uom possente sei tu) were cerebral. Plácido has not come out yet. He is not the type to avoid fans. This was the first performance of Verdi’s opera in a series of four in this season. He was adulated, got around 5 curtain calls, and stepped out on the stage each time, posing, but with modesty, he wanted to thank all the waves of applauses, he did not complain, he did not claim to be tired, he seemed amazed: “I have three more performances, you will see me again”. Evelino Pido left too, almost unnoticed outside the theatre, still so important in the pit. The orchestra was sublime, controlled with perfect elegance, so that everything can be heard, any mezza voce, any whisper, but having its own life, that of a warlike score in the prelude to act III or in the shakespearian vision of Boito’s painting, in Otello’s the Doge’s council room. Plácido did not come out. He invited us all inside. He does not want anyone to leave without giving him at least one moment. The stage door keeper opens the door and invites small groups of people. I look through the grating, I see him seated at a table, signing. “He is so handsome!”, this is all I can say. It is the first time I see him on the stage and he is close to the end. He wanted to be Simon because this is the most beautiful good bye he could afford. A long good bye that had started in 2010, even if, meanwhile, his barytone repertoire has increased with Rigoletto and I due Foscari, the great good bye continues on the world’s stages, somehow better and better from the vocal point of view. Yesterday he sounded really much better than on the DVDs from London, New York or Scala, this phenomenon-person has this part in his pocket now. Which makes Tutto favella il sento, in me d’eternita completely move the soul of any music lover. Gran Dio ti benedico, Placido… I am very close to him, only one meter away. The years have passed over his hair, which is now white, and over his beard, beautifully trimmed, and they have left on his face a distinction that very few can enjoy at his age. He is signing a program and is smiling, while we are telling him that we see him for the first time in our lives and we have come from Romania for this. He is smiling again, filled with that warmth only he is capable of, and he allows me to take a picture. His modesty is totally overwhelming. I am thoroughly moved and… I am a fan for the rest of my life. Oh my god … this is a wonderful story! I love it! It describes so well, what he is, how he is and what he does for millions of fans all over the world. It explains, why he is so much loved and admired. Maybe you stood even next to us… 😉 We were in the crowd outside. I can add another little story to describe HIM: We had thrown little bouquets onto the stage after the performance. This is a thing we always do, when we see him. A bouqet of red-white-red (Austrian flag colours) carnations for him and some smaller ones for the rest of the cast. If we threw only flowers for him, he would not keep them, but share them with his colleagues. Yes, yes! I remeber you throwing those flowers in the end! Thank you so much for your comment, I’m very glad you liked my article. I have tears in my eyes, your article is so beautiful, thank you for sharing your feelings with us! When I saw Plácido in November in Simon Boccanegra I had the same feelings and experience as you 🙂 beautiful memories! I wish you all the best! I agree with Andrea, me too, I had tears in my eyes when reading your post! It is so exactly how he is and how we feel about him! I’ve been in Vienna in November, too and will in some days. Thank you for sharing your emotions with us! I’m speechless. Thank you very much for your comment. 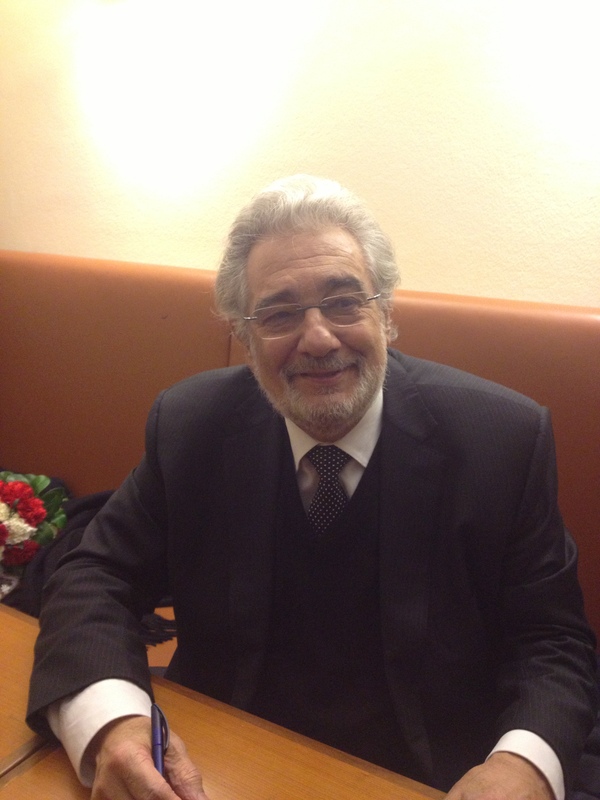 Placido Domingo a Spanish tenor and conductor known for his versatile and strong voice, possessing a ringing and dramatic tone. Nimic mai minunat sa iti vindeci sufletul. I saw a later performance and I was not so ecstatic about it. 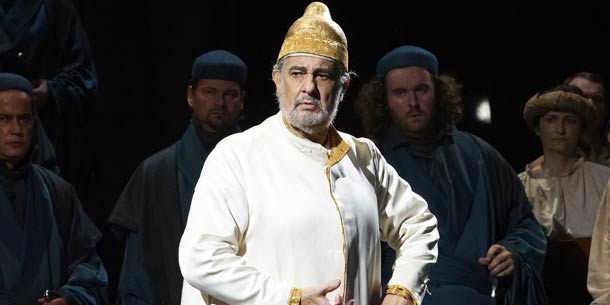 Of course, Placido is impressive in just about every aspect, especially thinking that he is like that at an age when others hardly remember ever being on stage. The others though were in a different league. The tenor has a very nice voice and sang well, but I felt he was uncomfortable with something. Pertusi is too soft IMO for this part and many he is doing; while I generally like him in Rossini and some other belcanto parts, I find him insufficient in Verdi. The soprano had a cold [or so we were told] so I put on it the too-many vocal imperfections and tonal imprecisions; despite a large voice, she is too lyrical for a part where a fuller soprano is required, her low register was almost absent, her upper one was shrill, somewhere in the medium she was almost ok. Caria was a nightmare, both vocally and dramatically. The staging is awful, a drab and dreadful kitsch with no coherence between scenes, with a few adds-on absolutely futile [like the coffin in the prologue] and with a few things absolutely derisive [the painted dirty rag in the Council-scene behind the Doge]; maybe a bit more interesting in the dormitory scene. Caria’s costume was another nightmare, he looked like he was brought from one of Ceusescu’s worker-teams at the Channel. Pido’s conducting was correct, with no discrepancies [a rare thing for him], but absolutely neutral and borig; luckily, the Wiener Phil is a marvelous instrument that can very well play without a conductor, maybe even better. Well, in the first day (17 feb.) the soprano was OK, without any cold. Amelia can be sung by lyrical sopranos (like Kiri Te Kanawa, or Angela Gheorghiu) or by spinto ones (like Tomowa-Sintow or Anja Harteros). The results are different. The production is a matter of taste. I personally liked it, in its whole minimalism. I liked De Biasio quiate a lot, he has a very nice voice, he was at his debut in Adorno’s role and he did it very well. I only share your opinion about Pertusi as being too soft (but not bad). First I was dissapointed by the conducting that was only just correct, but boring and that says a lot. Second, I disliked the settings and in part the costumes. Minimalist I can accept, drab and kitch no; besides, there was a constant change of concept between scenes. The stage direction wasn’t very effective either. Kovalevska was off-pitch and shrieking for the whole first part and mostly inaudible in the lower register. I admit a lyrical soprano can cover the part, but both Te Kanawa and Gheorghiu DO have a good low register, while MK does not. Caria was also dreadful. Pertusi was too soft and at times inaudible.I didn’t dislike De Biasio, but I wasn’t impressed, he could do more at times. So what remains to be praised? Just Domingo who is the only one able to keep this performance standing….. In fact, my belief is that this opera needs exssentially an inspired conductor or it becomes awfully boring. from the dozens of performances I saw and heard only one was IMO doing justice to the score and that one had a very unequal cast. Which one was the version you liked? The debate over the production is pointless somehow. The premiere of it was at Salzburg in 2002, then it went to Firenze and finally remained at Vienna. There are 2 DVDs with it (Firenze and Vienna, both in 2002). For someone who is passionate about opera, you should have know what to expect when going to Vienna to see Boccanegra: it’s that Stein’s production. Why complaining after 11 years from its premiere, while most of the critics praised it? I liked a performance I saw in Budapest some time ago. Conductor was György Győriványi Ráth . A production looks different on tv and in the house. The tastes change over the years and I do not feel compelled to agree or disagree with the critics – each can have one’s own view and some may be biased by various lesser known factors. I heard many a critic say one thing in private and another in public. And after 11 years [only, it felt like 111!!!] it is indeed drab. Time to go to scrap! And I could put up with a poor production were it a splendid musical performance, which was not. Just somehow average, not really bad, nor really good. And boooooooooooring. I remember a comment you made some time ago, about Tosca at ONB. You defended with a high degree of tolerance a production which was considered by me as dusty and not good…. I don’t want to impose my opinion. I just liked the production with all its minimalism. The coffin of Maria was almost unnoticeable, even from the front rows, anyway I cannot find anything wrong with it. Costumes were very nice and the chorus movements added more value to them, especially in the Council scene. The beginning of act three was really nice with the battle scene. I liked Pido too. Orchestra responded anyway much better than what you can see in Bucharest. As for the cast, I partially agree with the fact that Pertusi was softer than a usual bass singing Fiesco, but he sung well too. And yes, the lower range of Kovalevska was weak, but without spoiling Amelia’s part. Funny to mention the orchestral response and to make the comparision. Technically we are speaking about 2 EU capitals and their main ensembles, yet we speak about two worlds completely apart. It would take too long to disect all the history and tradition and way of thinking of the 2, but making any comparision is ridiculous. 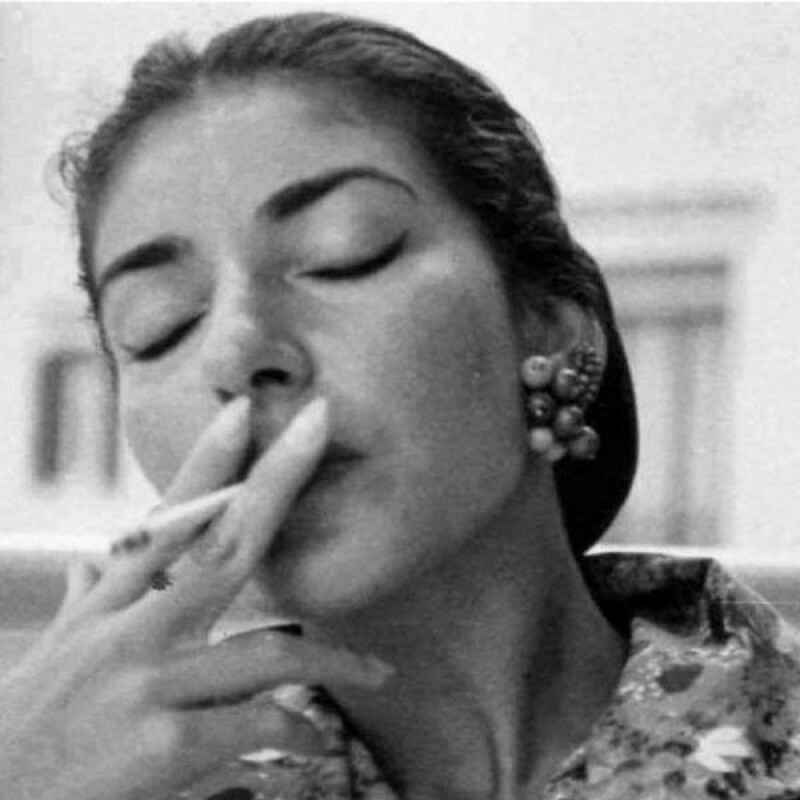 We can compare old productions and see what’s good and what not in any of them – I prefer Tosca, which is more true to its era and more congruent in style and it resisted better the passing of time, although I feel it also to be outdated. In the 21st century we need different things, although sometimes we do not admit it and we are not always prepared for them. As for performance I have different standards for different scenes. I have long ceased to expect much from the Bucharest musicians so every good thing is a pleasant surprise; it is also extremely cheap to go there. On the other hand, when one pays 100 to 200 euro for a good ticket [which is some more than 10 times the price in Bucharest] the expectancies change and the level of tollerance decreases. It’s maybe like comparing eating in a canteen and in a 4-star restaurant. You do not pay the same and you do not take or expect the same. You may be shocked, but I think the opera-performance is a kind of goods just like any other, fulfiling one of our needs and for which we pay a price; it can be evaluated by certain criteria for quality and those criteria can be adapted to the product and the conditions it is provided. So I can consider a certain performance to be very good for Bucharest [as it is now] and very poor for Vienna. In Bucharest I saw much better performances of Boccanegra than the one I saw in Vienna, which were it not for the special presence of Domingo, would have been at best mildly agreable and completely forgetable. And, please, do not over-rate Pido. In Vienna the orchestra is doing it’s part almost regardless of the conductor, I do not think I ever heard it fail in it’s job. With a less-than-perfect orchestra he wouldn’t have been so great, I saw him in more than one occasion lose control almost completely and have ugly desyncs in the orchestra or between the orchesta and soloists and that happening not only at reherarsal or first night, but also much later in the run. And just being correct is by no means being inspired or interesting, I need more than that. As for MK – I admit she is a beautiful woman with a big voice and a natural stage presence. But singing decently about half of the evening [and that is the most I can grant] doesn’t make her a valid presence. Even with a cold that could be an excuse for some things, there were many unsolved issued vocally. And if a perfect technique is not a synonim of a great performer, a performer cannot be great without a very good technique. She still has a lot to learn and improve to get there and to this kind of roles that are not yet in her grasp. And that is not always true. It’s a miracle indeed that good voices continue to emerge from Romania despite the lack of tradition or support. However, there are very few voices that confirm at an international level. Let’s keep things apart. There is Placido Domingo, there is the tradition of Vienna, there is Verdi sung by Italians like Pertusi and De Biasio and these are one thing. There is a nice try to keep up with this coming from our artists, but this a different thing. It’s enough to hear them singing sacred music, the difference became even bigger.